The Airedale Terrier (also known as the ‘Waterside Terrier’, ‘Bingley Terrier’, or slightly less modestly the ‘King of Terriers’, for its height) comes from the Airedale valley in West Yorkshire, England. It was bred by crossing the Otterhound with the Black and Tan Terrier for increased ability in Water Rat hunting competitions on the Aire River. The result was a breed with great scenting and Otter hunting skills which could pursue and retrieve game from its den. It was later crossed with the Irish Terrier and Bull Terrier. The Airedale Terrier was first brought to North America in the 1880’s. Champion Master Briar, born in 1897, is considered to be the patriarch of the breed. Airedale Terriers became renowned as messengers and search animals in World War I. President Roosevelt is quoted as saying ‘An Airedale can do anything any other dog can do and then lick the other dog, if he has to.’ John Wayne’s nickname, ‘The Duke’, was the name of his childhood Airedale Terrier, who accompanied him everywhere he went. The Airedale Terrier has a shoulder height of 56-61 cm (22-24 in) and weighs 20-33 kg (45-70 lbs). There are some lines called ‘Oorang Airedales’ or simply ‘large type’ which weigh 23-45 kg (50 to 100 lbs). 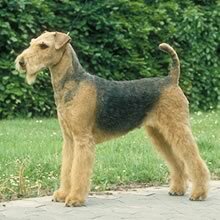 The largest of Terriers, the Airedale has a long head, deep chest, flat back, straight legs, and small, round feet. Airedale Terriers have floppy ‘V’-shaped ears, small, dark eyes, a black nose, and a scissors bite. They have a highly set, erect tail. The Airedale Terrier’s teeth are the largest among Terriers and can inflict a strong bite. The Airedale Terrier has a smooth, hard, wire-haired outer coat with a short, soft undercoat. The coat is tan with black markings on the back and sides. The black may be mixed with gray and white (called ‘grizzle’). Airedale Terriers do not shed heavily. Their scruffy chin hair has the appearance of a goatee. The Airedale Terrier is loyal, but can be stubborn. Airedale Terriers are active, intelligent and playful. They bark infrequently. Airedale Terriers are courageous, but can behave mischievously. The Airedale Terrier is loyal, but can be stubborn. Airedale Terriers are active, intelligent and playful. They bark infrequently. Airedale Terriers are courageous, but can behave mischievously. The Airedale Terrier is patient with children and tolerant of other household animals. It may try to dominate other dogs if not trained properly. Airedale Terriers are fearless and alert at all times, but not aggressive. They are responsive, outgoing, and confident. You can find Airedale Terrier puppies priced from $300 USD to $2500 USD with one of our credible breeders. Browse through our breeder's listings and find your perfect puppy at the perfect price. The Airedale Terrier is patient with children and tolerant of other household animals. It may try to dominate other dogs if not trained properly. Airedale Terriers are fearless and alert at all times, but not aggressive. They are responsive, outgoing, and confident. Pet Airedale Terriers require little grooming, but show dogs need substantially more attention. Pets should be combed twice a week and plucked twice a year. Show dogs are usually ‘stripped’ by pulling out loose hairs via a serrated knife edge. Airedale Terrier s generally have excellent health, but like many breeds they are susceptible to eye problems and hip dysplasia. The Airedale Terrier has a life span of 10-13 years and litters of 5-12 puppies. The Airedale Terrier quickly understands what is asked of it. If not given variety in training, Airedale Terriers can become bored and refuse to perform. Bred to hunt, the Airedale Terrier requires several walks a day and playtime in the yard. Puppies require even more frequent exercise. Swimming and playing catch are among the Airedale Terrier’s favorite activities, but they are very boisterous indoors as well. Airedale Terriers are not suited to apartment life. Airedale Terrier Puppies for Sale - Shipped Worldwide! Finding the right Airedale Terrier puppy can be dog gone hard work. PuppyFind® provides a convenient and efficient means of selecting and purchasing the perfect Airedale Terrier puppy (or Airedale Terrier puppies) from the comfort of your home, 24 hours a day, 7 days a week. Take advantage of our PuppySearch or leisurely browse our directory of hundreds of dog breeds, Airedale Terrier dog breeders, Airedale Terrier dogs for adoption, and Airedale Terrier puppy for sale listings with photos and detailed descriptions. Some Airedale Terrier puppies for sale may be shipped Worldwide and include crate and veterinarian checkup. Many Airedale Terrier dog breeders with puppies for sale also offer a health guarantee. With thousands of Airedale Terrier puppies for sale and hundreds of Airedale Terrier dog breeders, you're sure to find the perfect Airedale Terrier puppy.